The $75 million is the first installment of the UNDP FFS fund. The rest of the pledge will depend on the UNDP's success in "putting in place additional accountability, transparency, and due-diligence measures," USAID said. USAID also announced that it is soliciting "innovative" ideas agency-wide to support the resettlement of ethnic and religious minorities in their ancestral homes in Iraq and that the results of that competition will be announced in early Spring. The USAID announcement is eight months in the making and comes after lawmakers and human rights activists repeatedly argued their case to top officials at the State Department and USAID, which had resisted any change to their "religion-blind" policy of channeling most of the aid money to the United Nations. That prior policy was "needs-based" and did not give priority to Christian and other religious minorities in Iraq, even though both the Obama and the Trump administrations have declared that both groups, as well as Shiite Muslims and others, have suffered genocide at the hand of ISIS. ISIS's campaign of murder, kidnapping, and enslavement decimated the Christian population in Iraq, which numbered between 1.4 million in 2002 and is now below 250,000, according to human rights groups who worked to chronicle the ISIS genocide in Iraq. Catholic charities and activists who have spent years urging the Obama administration and now Trump administration to better assist minority religious communities in Iraq applauded USAID's policy change and the United Nation's commitment to help these communities with the funds. "Vice President Pence deserves great credit for turning the ship of state in order to help save Iraq's besieged religious minorities," said Nina Shea, an international human rights attorney who directs the Hudson Institute's Center for Religious Freedom. Shea said the policy change now requires USAID to undertake the difficult task of ensuring that the troubled UNDP, which she said "has long marginalized these Christians and Yazidis, finally applies some of our funding to assist them in a meaningful way." 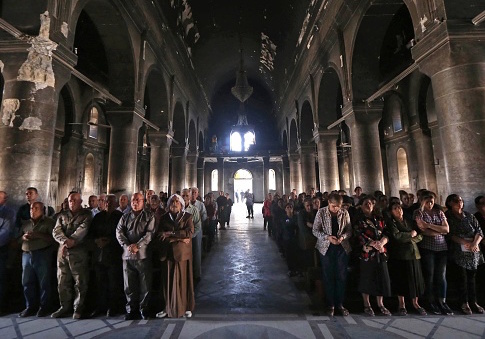 "All of us committed to seeing their communities survive the cradle of Christianity will be monitoring the implementation in the months ahead," she said. The Washington Free Beacon obtained photos of United Nations Development Program projects in Christian and Yazidi towns in northern Iraq, showing "completed" school-rehabilitation projects that amounted to a thin coat of paint on exterior walls with freshly stenciled UNICEF logos every 30 feet. Republican Reps. Jeff Fortenberry of Nebraska, Robert Aderholt of Alabama, and Chris Smith of New Jersey, along with Democrat Rep. Anna Eshoo of California, last fall sent a letter to USAID Administrator Mark Green arguing that these communities now face "dire conditions where they desperately need assistance if they are to survive." The concern prompted USAID counselor Thomas Staal, one of the agency's top officials, to visit Iraq in early December to see how the U.S. and Iraqi government could improve its support for minority communities following the defeat of ISIS. "I spoke to the congregation, and assured them that the United States stands with them. Americans stand with them in their hour of need, and we are committed to helping persecuted Iraqis continue to rebuild as they seek out that bright future," he wrote.